I will be at the Calgary Comic and Entertainment Expo again this year, and you will be able to find me at the Figure 3 Illustrations booth, as always. This year we are in a different building: the BMO Centre, at booth C05, not far from the entry doors. Which brings me to a side point: last year we were in the Big Four building as part of a pilot project, and while it was great, it was definitely quiet by comparison to the BMO Centre. Our impression from speaking to others at the con was that a lot of people didn’t even know there were tons of exhibitors in the Big Four. 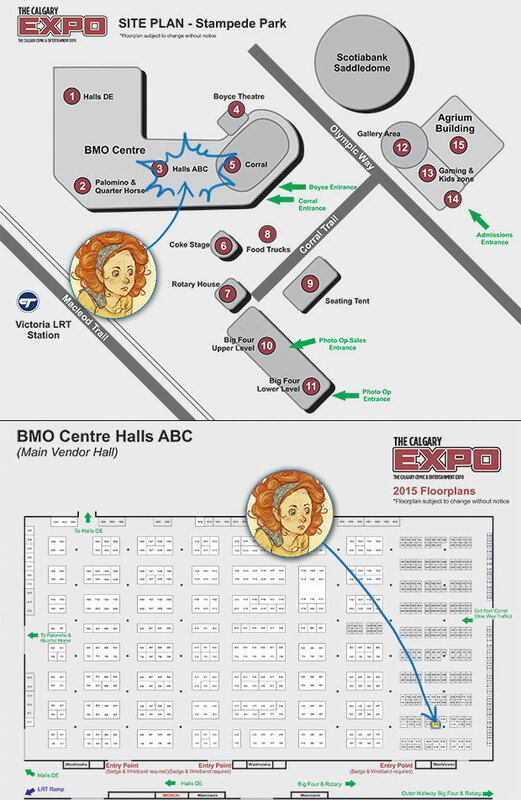 So if you’re attending CCEE this year, make sure you take the time to walk over to the Big Four. It should be even more full of good stuff than last year. There will be copies of Issue 1 and the brand new Issue 2! As well, there will be various prints, and a brand new comic-size book of concept work that Figure 3 put together. Each of us worked on a well-known fairytale with a twist. I am so excited and I haven’t even seen it in print yet. My fellow Figures and I will also have handmade trinkets for sale, so come on by. You may find you can’t live without a handmade Star Wars tissue case… 😉 Please come and say hi! I’ll be the one nervously pretending to read a book.